You've got a TV, cable box, Roku or Apple TV, Blu-ray player, stereo system, and who knows what else clogging up your living room, each with its own peculiarities and taking up space. When did watching TV become so much work? 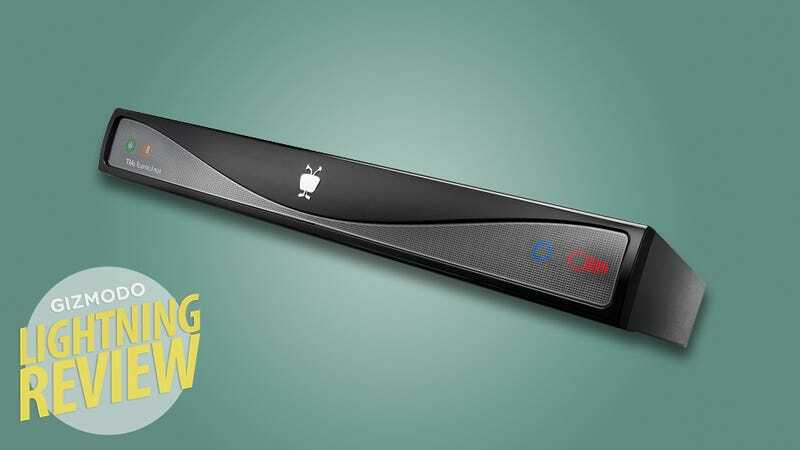 TiVo's new Roamio DVR/Cable receiver helps you do one thing we all desperately need to: simplify. TiVo's newest mid-range model DVR/cable receiver designed to replace not only your Apple TV, Slingbox, and Roku, but also the box from your cable provider as well. People who have cable or Verizon FIOS television service and want all of their living room entertainment options to reside in a single peripheral device. An unassuming black box emblazoned with the TiVo legged TV mascot. Four status lights on the front face disappear behind the silver accent when not active. On the rear, the Roamio includes a hardwired Ethernet port (as well as built-in Wi-Fi), component and composite inputs, an optical audio out, one HDMI out, two USB 2.0 ports, and one eSATA (external storage) port. TiVo's releasing three versions of the Roamio: the base model with 4 tuners, ATSC, 75 hours of HD storage, and built-in wireless for $200; the Plus with 6 tuners, no ATSC, 150 hours of HD storage, built in in wireless and streaming for $400 (which is what we're reviewing); and Pro with 6 tuners, no ATSC, 450 hours of HD storage (3TB), built-in wireless and streaming for $600. The Roamio remote looks, works, and makes same obnoxious blip sound just like previous iterations of the TiVo controller. Sound effects aside, I was really impressed by its responsiveness—especially after having to deal with the Vizio and LG remotes for the last several weeks—there was very little need for precise aim, just point it in the general direction of the box. Initial setup was simple enough. Unplug your cable box, transfer the coax cable and any component connectors to the Roamio, power it on and follow the onscreen instructions. The Roamio took its sweet time detecting and connecting to my home Wi-Fi network but once it did, it streamed content at the same speed as the Sony streaming Blu-Ray player I normally use. You'll need to order and install a multistream CableCARD from your cable company (which can and likely will be a slog since they're losing money by providing you with one) before you can watch live television, but streaming works right out of the box. And once you have that cable card, you can eliminate both your Roku and cable box from the entertainment cabinet because they're now both redundant. In terms of day-to-day usage, this box is tops. I'm not really sure how I got along without it. The UI is very similar to previous versions so the learning curve is shallow. I can flip through an accurate and timely schedule of Comcast programming personalized for both my service area and plan (mirroring the schedule produced by my actual cable box) then flip over to a unified streaming/DVR screen that displays not only the 150 hours (max) of HD recorded local content but also access Netflix, Hulu, Spotify, Pandora, and a host of other such services with a single button press. I can also simultaneously record up to six shows at once, so I'll never again have to wait for the two shows I'm recording to end in order to switch over to one that I want to actively watch. It's just so dang intuitive. To switch between TV and Netflix I just need to hit the TiVo button on the remote, pick a streaming service from the list, pick a show, and hit play. There's no input-switching, no fumbling for multiple remotes. Thanks to the Roamio, the division between live and streaming content is crumbling faster than the Berlin Wall in 1989. Right now, the worst part of the Roamio is how brand-spankin' new it is. We received a pre-production model for this testing so many features are still in early, early beta. For example, the Roamio currently requires a hard-wired Ethernet connection to stream content to your existing TiVo boxes in other rooms, and it demands a separate streaming box connected to your router in order to push and download content to mobile devices (only the iPhone and iPad at the moment). Future software updates will allow you to do so over any Wi-Fi connection (to presumably iOS, Android, and Windows platforms alike) but right now that functionality isn't developed enough to discuss fairly. We'll post a separate review of the mobile streaming aspects in the coming weeks once they're more fully baked. Well not so much weird as the most awesome feature ever: Remote Finder. Tap the remote control icon on the front of the TiVo box and the remote will begin playing an 8-bit tune, allowing you to find it quickly, easily, and without disassembling your couch. Total setup time, including channel programming, Wi-Fi discovery and streaming log-in: 48 minutes. Comcast CableCARD cost $1.50, slides into the back of the Roamio and sets itself up nearly autonomously. You will have to call your cable company to activate it however. Unified search feature is spotty, won't list Attack on Titan even though I just watched the latest episode on Hulu 20 minutes ago. Combined with a Chromecast, there's nothing you can't play on your HDTV. Supports up to 8 networked TiVo boxes. It's not compatible with satellite providers, AT&T U-Verse, or antennas. Android compatibility is expected within 3-6 months. There's a $15/month charge on top of the original purchase price that might (should?) turn you off. Maybe someday, but almost definitely not yet. The Roamio goes live on August 20, but the pretty-necessary mobile Wi-Fi streaming functionality—at least if you're interested in streaming content to remote mobile devices, a la Slingbox—isn't expected to go online until later this year. You'll want to wait until it does. Also, if you've you've already sunk a significant chunk of change into an existing DVR setup or streaming box that you're comfortable with, maybe pass on this. But if you're in the market for a unified set top box with streaming and recording capabilities, this is a good way to kill several birds with one remote.